Coming from our last house that did not have a fireplace, we feel so spoiled to now have a working fireplace in this house. 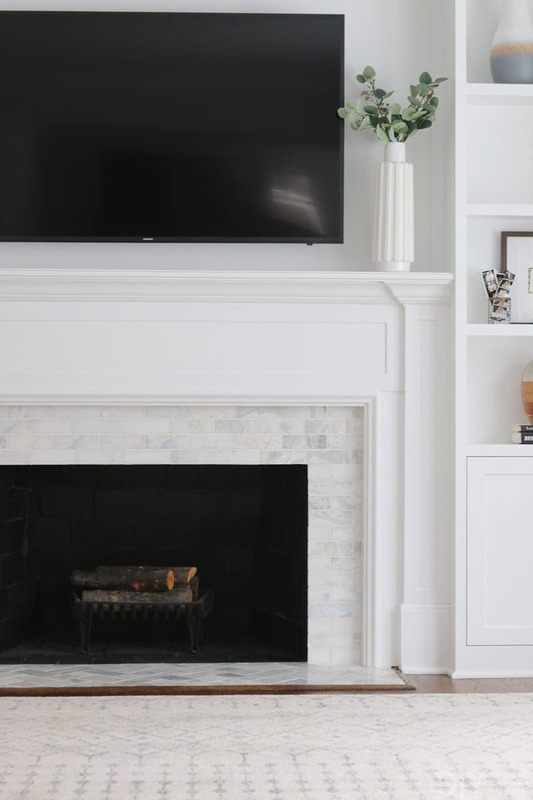 This is a wood burning fireplace and although we haven’t used it yet, the thought of someday cozying up by the fire is enough to make me love this feature. Or if nothing else, the idea of hanging our stockings there next holiday season has me all giddy. 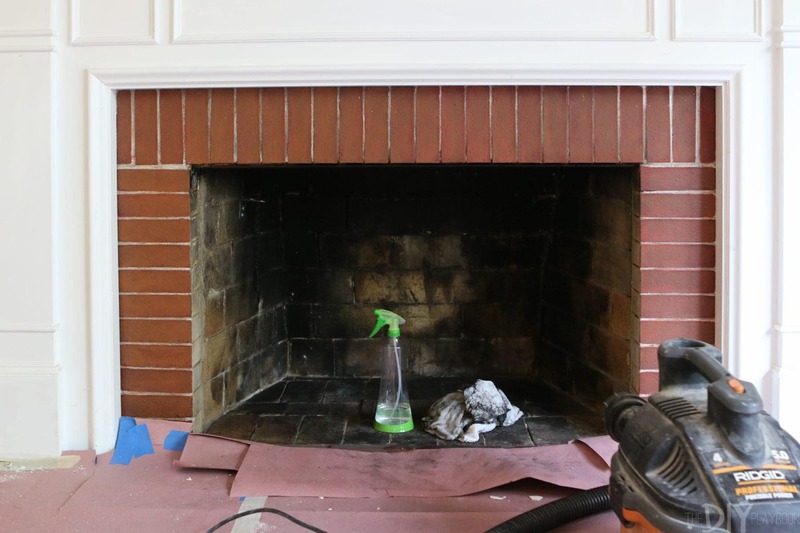 This fireplace did need a little TLC when we moved in though. 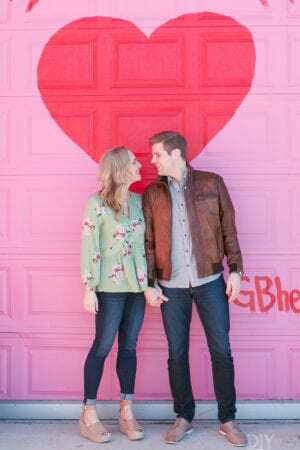 We had it tiled months ago, but I didn’t want to write a formal post about it until all of the updates were done. 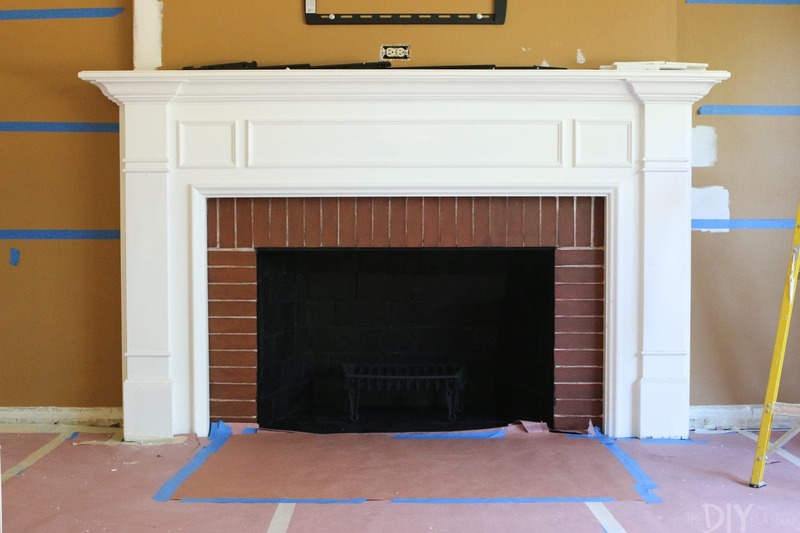 And now that the built-ins have been installed, I’m excited to finally dish all the details on our white marble tile fireplace! 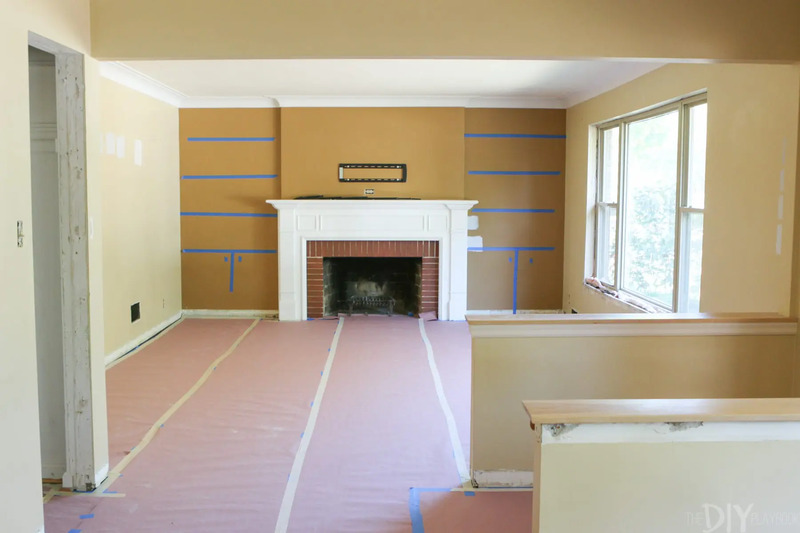 The fireplace looked like this the day that we moved in. Honestly, I didn’t think it was bad at all. It just needed to be cleaned up a bit and I wanted to swap out the old red brick for something that was a bit more me. 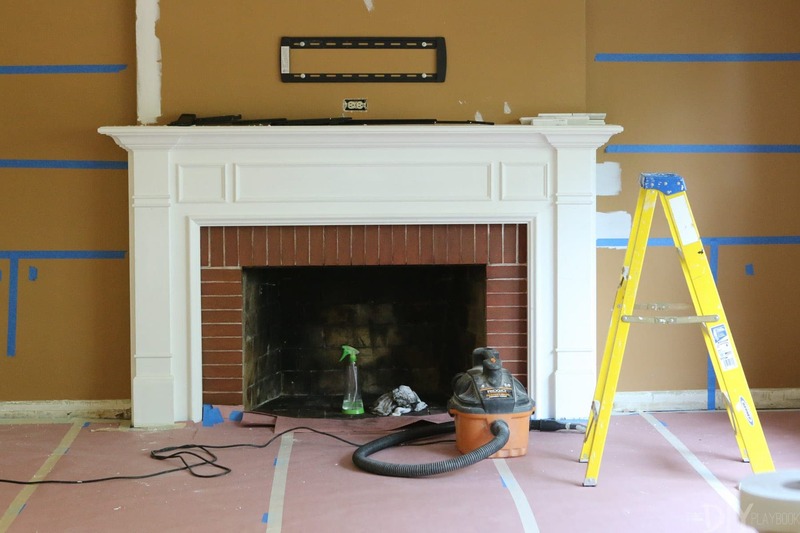 So as the demo and construction happened all around this fireplace, the first thing we did to update the look of the inside of the fireplace was clean it. 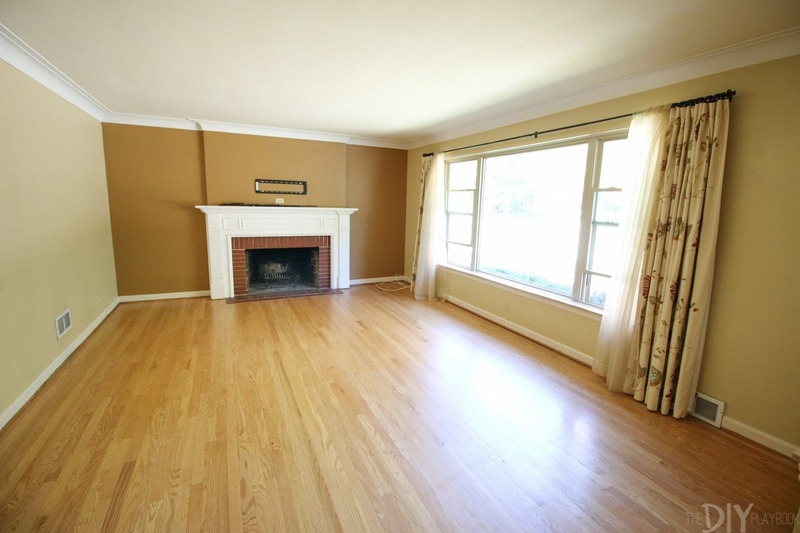 First I took our shop vac and vacuumed up all of the loose debris in the fireplace. Just that made a huge difference. Then I used a vinegar and water solution to wipe down all of the excess soot. Make sure you wear old clothes and use very old rags for this step because it is very messy. I was surprised at how much soot and black discoloration came off the walls of the inside of the fireplace just from scrubbing. But when it was all said and done, I wasn’t in love with the look because it was uneven and still looked dirty. 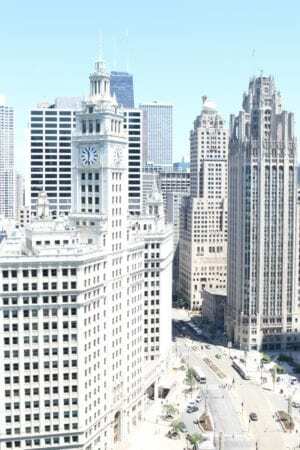 That’s where this amazing heat resistant spray paint comes in. 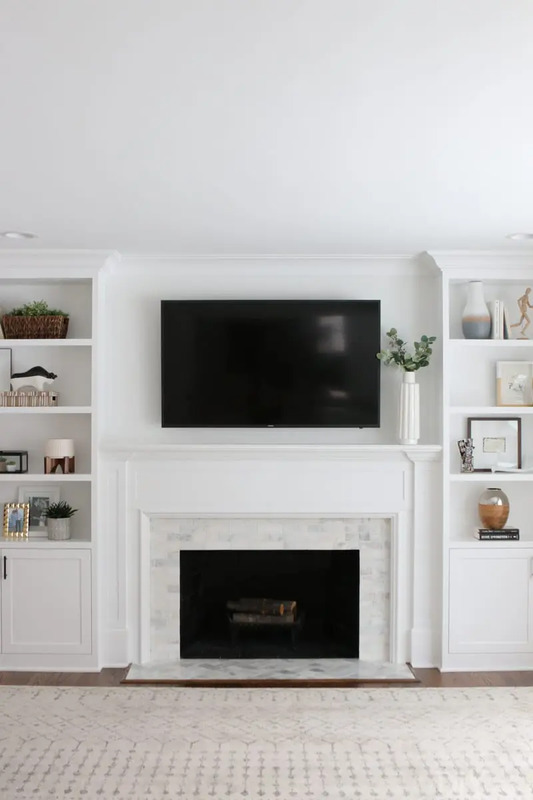 I used the same product that Casey used on her fireplace and Casey’s step-by-step tutorial to spray paint (and paint) the inside of the fireplace black. 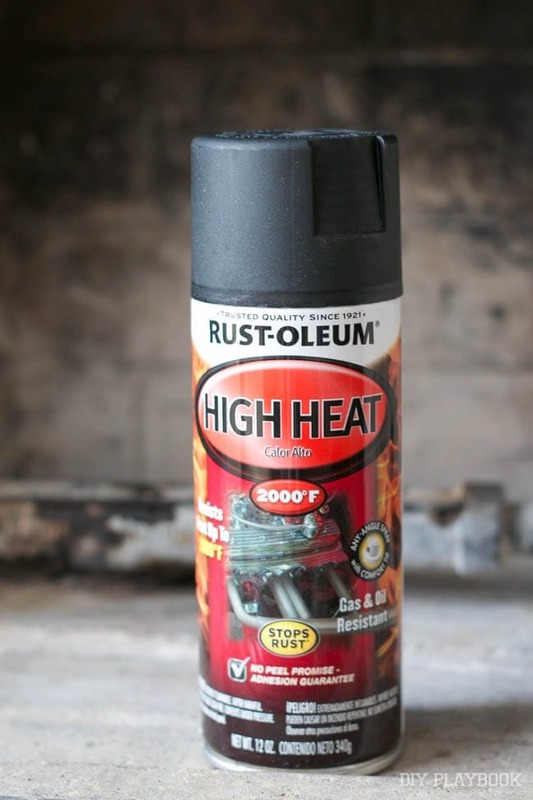 If you’re worried about spray painting in your home, Rustoleum sells this same product in a paint can that you can roll or brush onto the fireplace so you can avoid overspray. 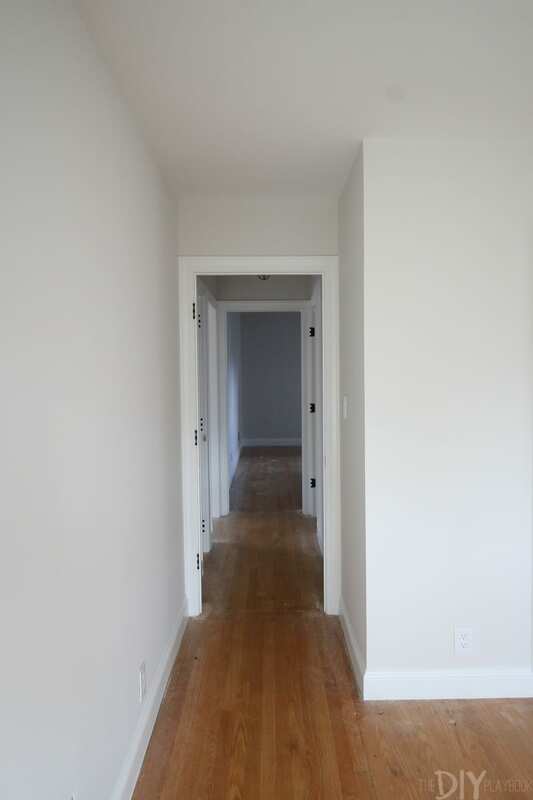 Just make sure your space is well ventilated because this paint has a pretty strong odor! Can you even believe the difference? 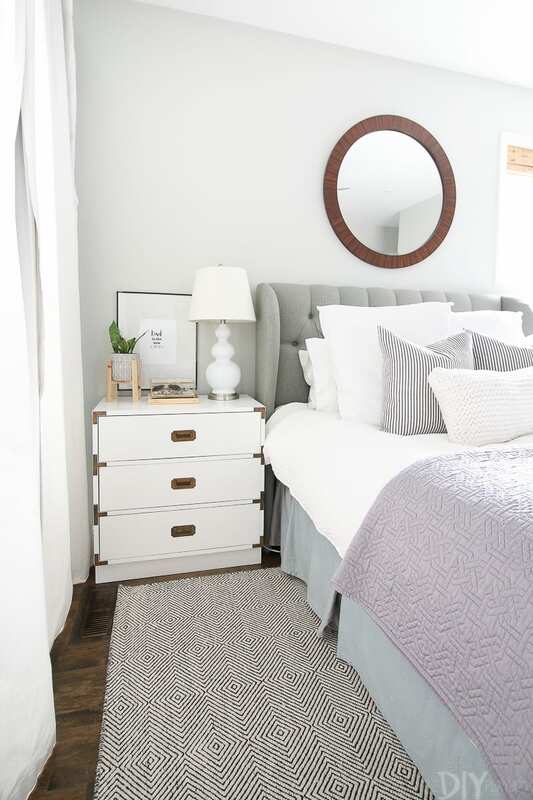 Just that one coat of paint made such an impact in cleaning up the look! I used the same cleaning/painting method for the log grates too. I didn’t feel it was necessary to go out and buy a new one, instead a little cleaning and spray paint made it look brand new. 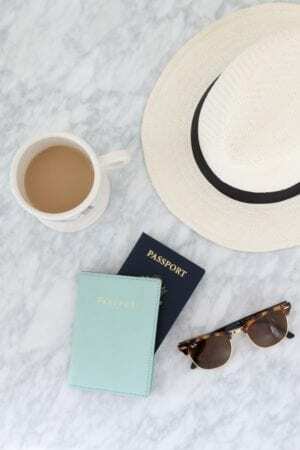 Next on the to-do list? 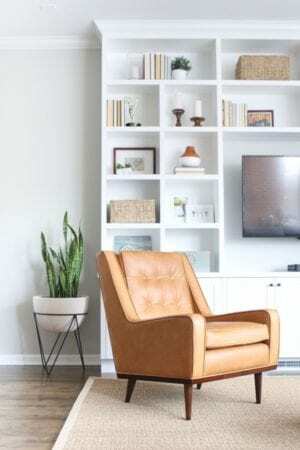 Choosing tile to cover up that old, red brick. 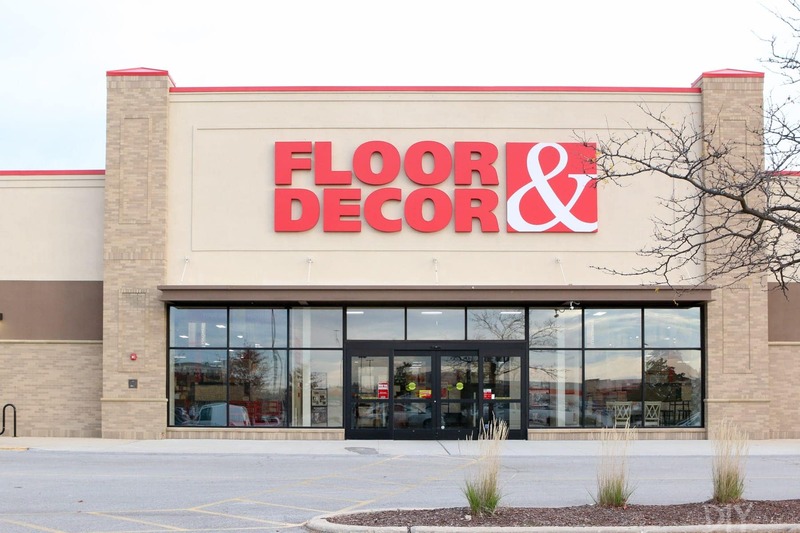 Matt and I visited Floor and Decor and looked at lots of tile options. I knew I wanted something very subtle and clean. 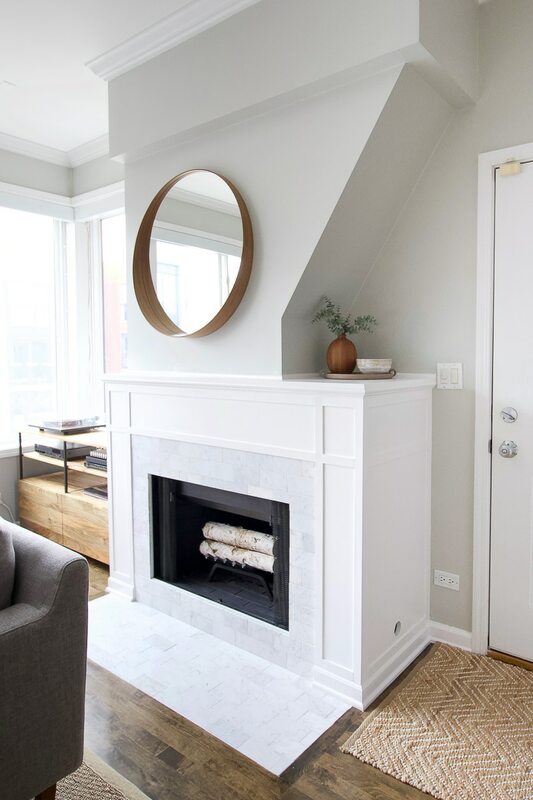 I also wanted to make sure it would withstand the fireplace heat and pull in a tiny bit of the neutral colors we planned on incorporating into this space. 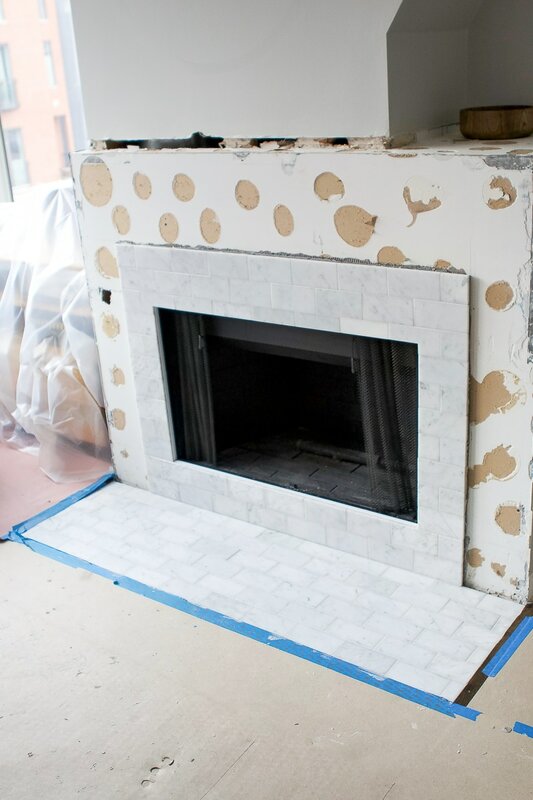 Ater seeing this fireplace project, I was sold on the look of white marble tile. 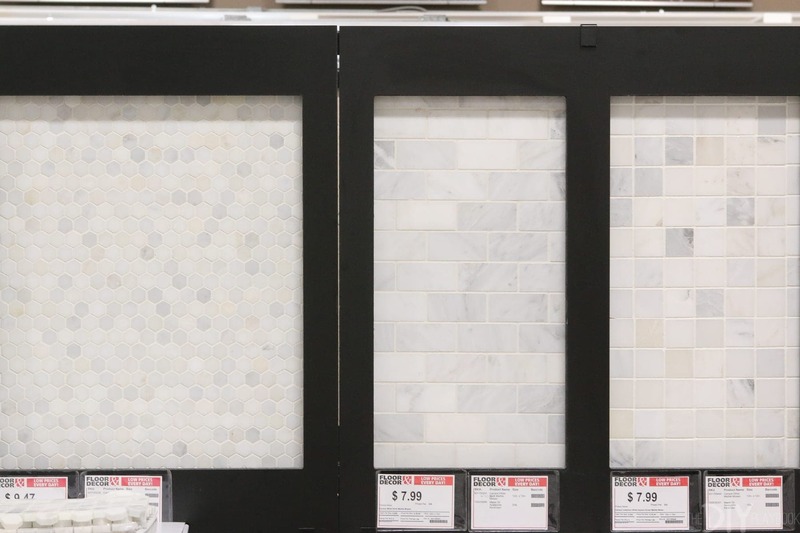 We actually ended up buying two different tiles from Floor and Decor, just like the inspiration photos. 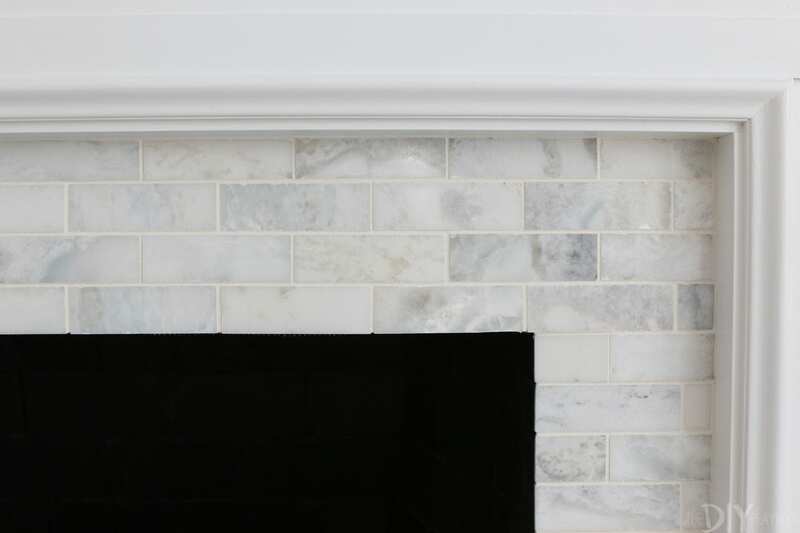 For the face of the fireplace, we bought a box of this tile (12×12″ Sahara Carrara Brick Marble Mosiac). 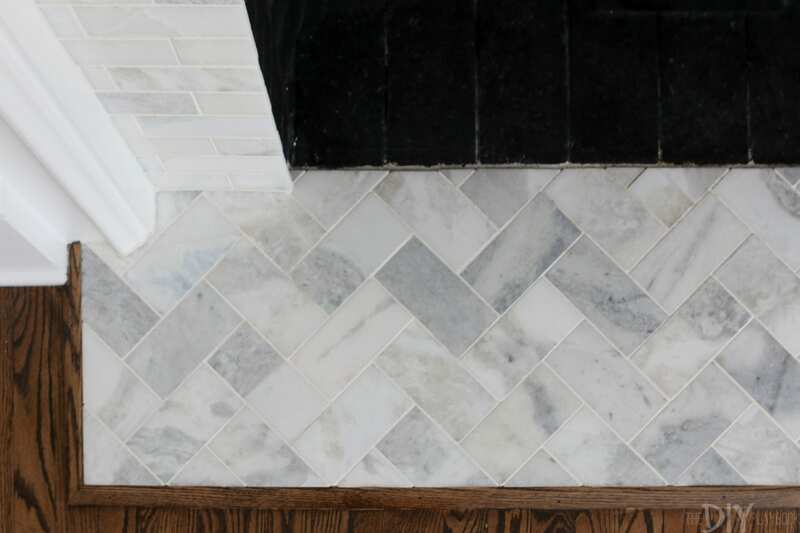 For the floor of the fireplace, we bought this tile (3 x 6″ Sahara Carrara Marble Tile). 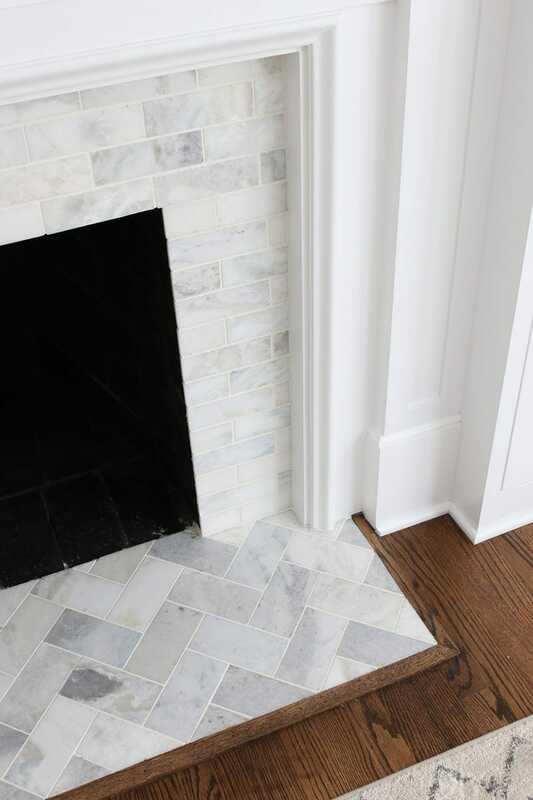 We chose to install the tile on the face of the fireplace like traditional subway tile but added a subtle contrast by laying the floor tile in a herringbone tile. 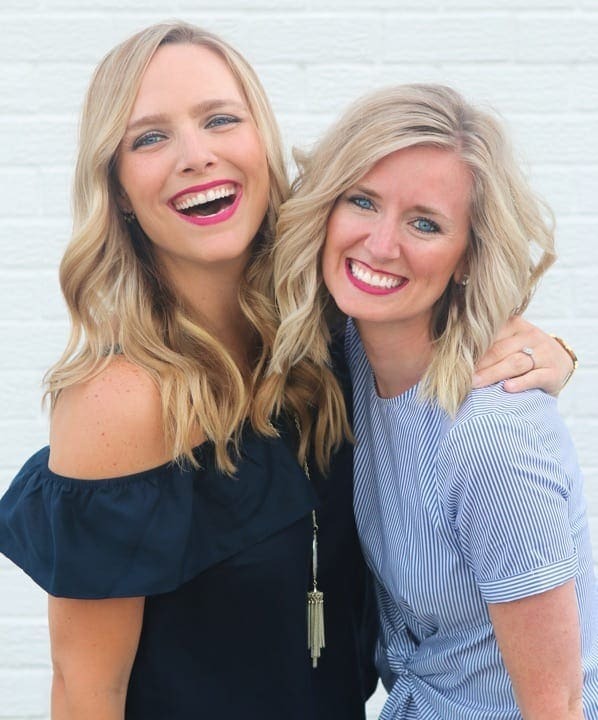 I love the new look but did make one mistake that I want to tell you guys about to save you the same problem. 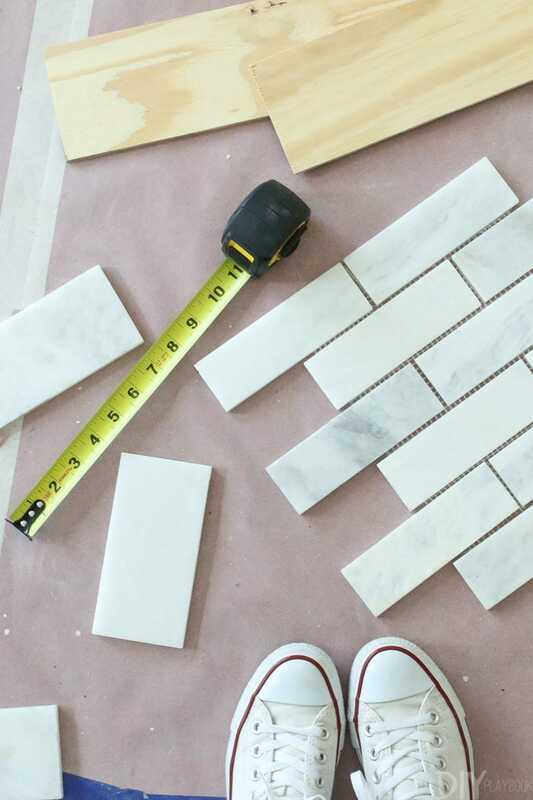 My advice if you’re recreating this project (or any marble tiling project!) is to go through the tile boxes and discard any pieces that you don’t love before tiling begins. 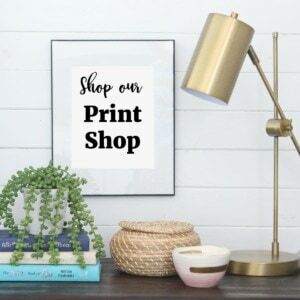 This will avoid you coming home to the same “surprise” that I did. At the end of the day, it’s not that big of a deal and I actually have come to really like the contrast. BUT if I knew what I know now, I would have definitely hand-picked the tiles I wanted to use (or at least the ones I didn’t want use) so that the look was a bit more uniform. Lesson learned for next time I guess. 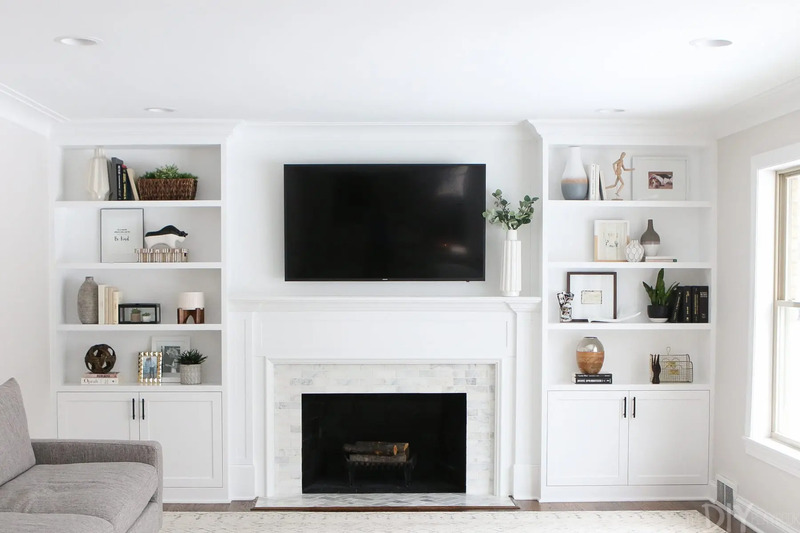 Once the tile was done, we waited awhile for the built-ins to be installed (which came with a mini facelift of the fireplace wood detailing) and now I can’t get enough of the new look. The hints of gray and beige in the white marble tile highlight some of the colors in both the rug and the couch. 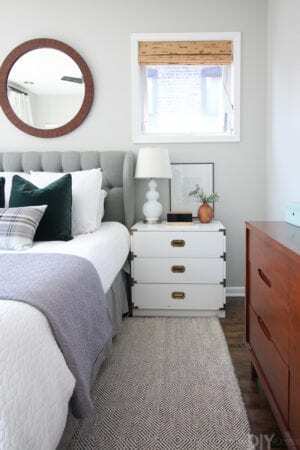 Plus, the white tile is such a clean look that doesn’t draw too much attention yet still looks classy. This little fireplace has come a long way since we moved in. 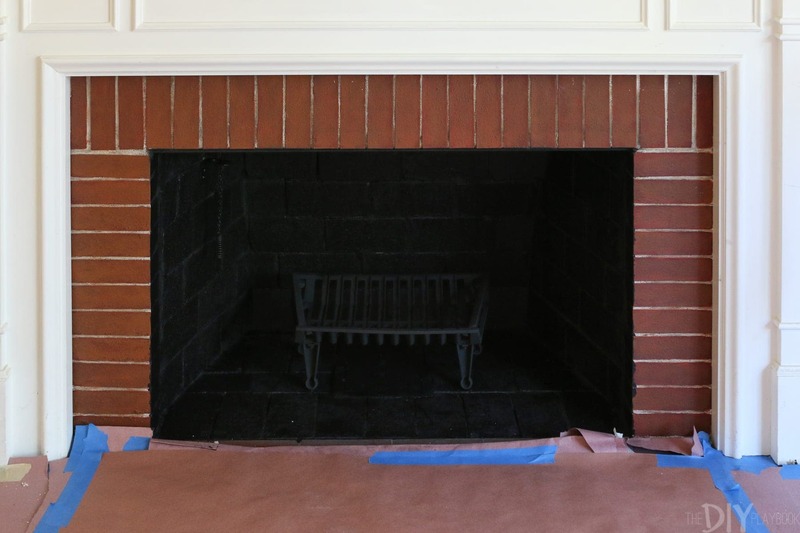 A good clean, a coat of black spray paint, some new tile, and this 65-year-old fireplace looks brand-spankin’ new!